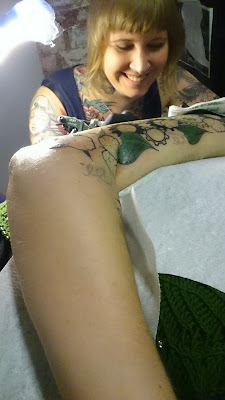 Jessica has been adding some colour on my left arm today, though we still have a session to go. I was very close to falling asleep a few times, starting to slip into dreams, realising I was dreaming, blinking fiercely and trying to pay attention. It only hurt twice, a nerve point close to the elbow and one close-ish to the arm pit. Though I do still have the false reporting, where I can vaguely feel the needle and her touch on my arm, but my brain reports being tattooed elsewhere, like on my neck or collarbone, and that it hurts there. Luckily this also applies with itching, I itch but not where I was actually tattooed, so I may scratch - lucky me!